I’ve been studying the season one opening, to try and find something. Perhaps this is common knowledge, but I was unaware of these details. Allow me to share this with you. 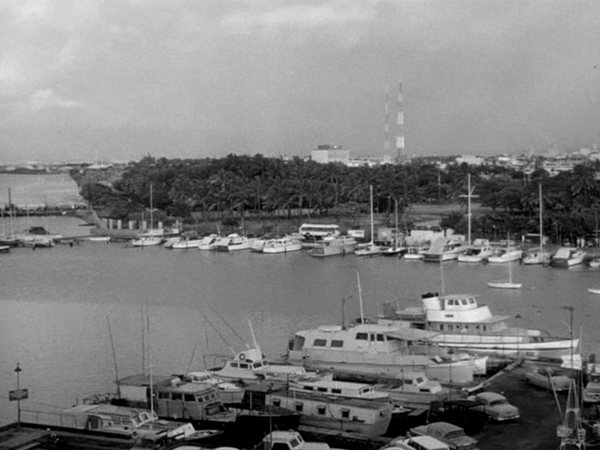 The season one opening was filmed at the Ala Wai Yacht Club in Honolulu. 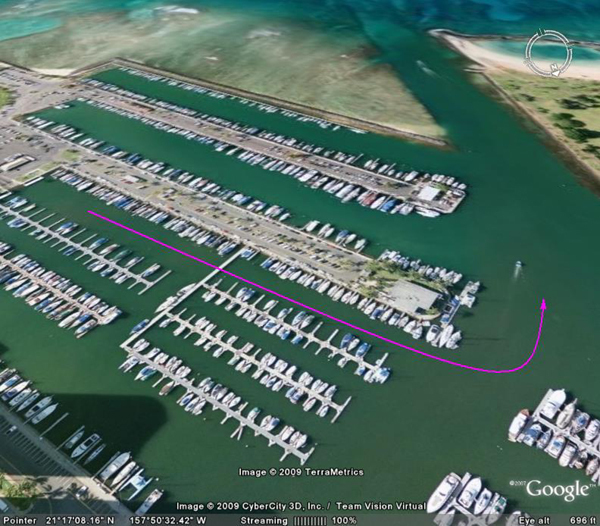 I’ve studied the harbor using Google Earth and the opening of Gilligan’s Island. Please refer to the following pictures. The yellow lines on the satellite image in Photo #1 above represents the pan shot from the show. In other words the yellow line on the left represents the first shot from the show, (Photo #2). Photo #3 represents where the yellow line is on the right. Obviously, 40 years have passed between the opening shot of Gilligan’s Island and the satellite images. Two things have remained the same; the two buildings seen in Photo #2. They are both visible in the satellite image of Photo #1. 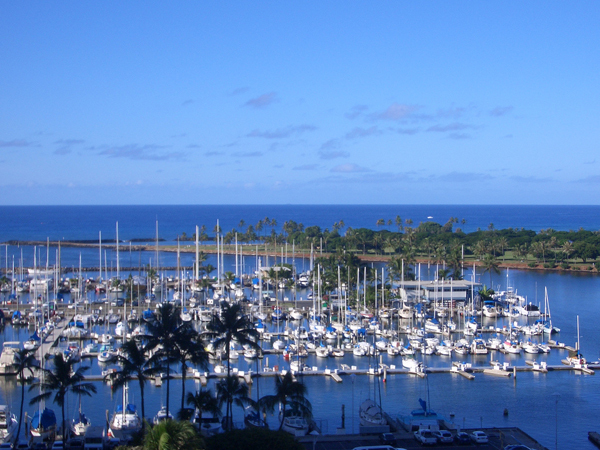 The larger of the two buildings (the one in the foreground) is the Hawaii Yacht Club. This is also the building that the Minnow passes and where the American Flag is flying at half mast, due to the Kennedy assassination in Photo #4. I have tried to identify where the Minnow was docked. As you know, there is extra footage of this shown on the Pilot opening (Photo #10). Unfortunately, I have not been able to locate where the Minnow was docked. I cannot even locate the swimming pool that is seen (Photo #9). Since 40 years have passed, I can only assume that the area had undergone some renovation. 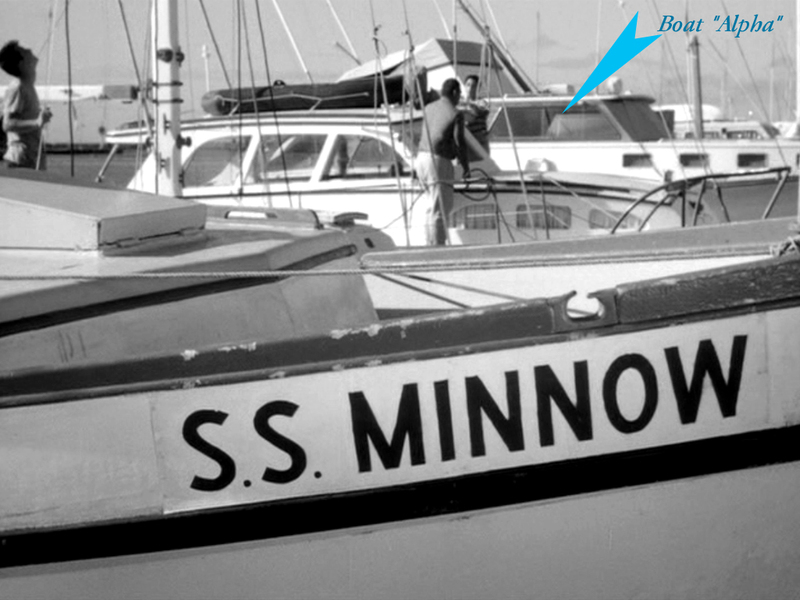 Since we know what channel the Minnow was sailing through, it stands to reason that she was docked somewhere in that area. 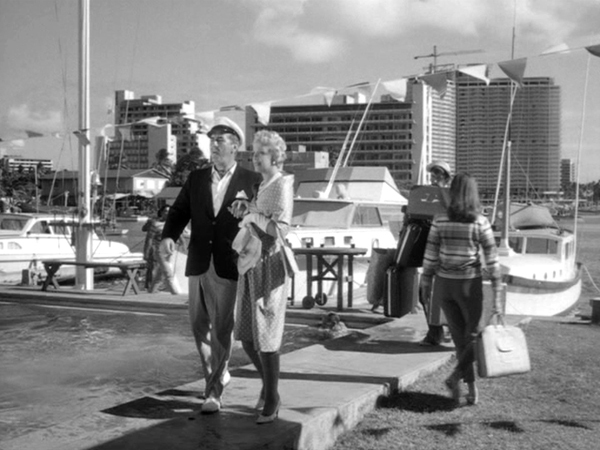 To summarize, the season one opening from Gilligan’s Island was clearly shot in Honolulu, HI, in a harbor called Ala Wai Yacht Club, near Waikiki. 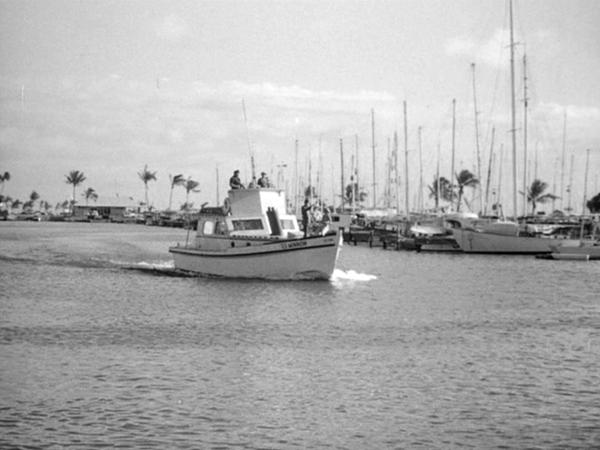 The Minnow passes by the Hawaii Yacht Club, as she rounds the bend to open sea. Where the Minnow was docked is uncertain, as the contemporary satellite images from Google Earth do not match the footage shot some 40 years prior. 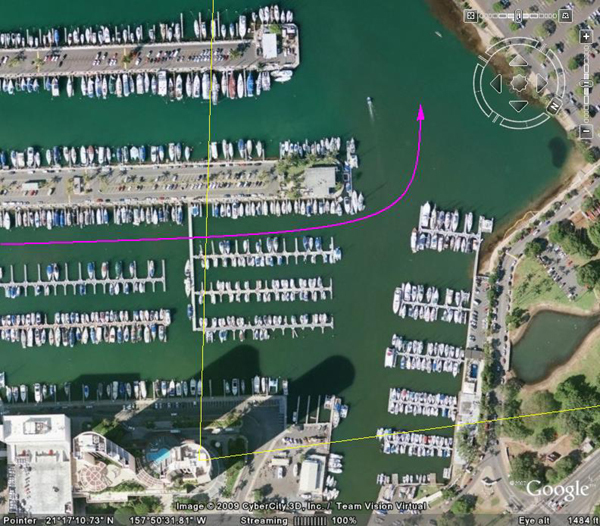 Similarly, I have studied the season two opening footage and cannot determine where the Minnow was docked [in Marina Del Rey] in reference to satellite imagery, again, due to 40 year span. Well, thanks for letting me ramble. Now you see what I do when I have extra time on my hands! I posted the article above on the location shots of the S.S. Minnow, from the first season of Gilligan’s Island. My research had remained incomplete, as I could not locate where the Minnow was docked – until now! My first breakthrough came from an email from Lawrence Borne. 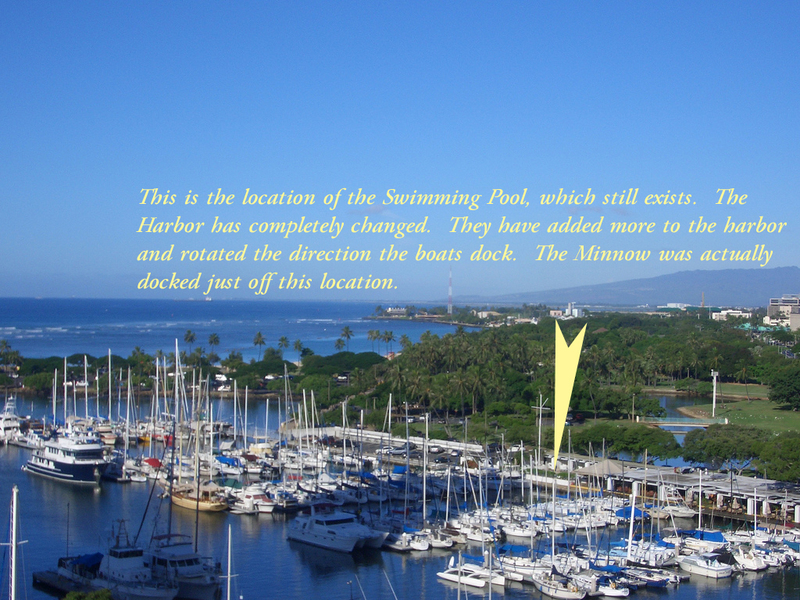 He let me know that in the Pilot of Gilligan’s Island – in the opening sequence, a hotel can be seen in the background. This is the Llikai Hotel, and it still exists today. That was what I needed. 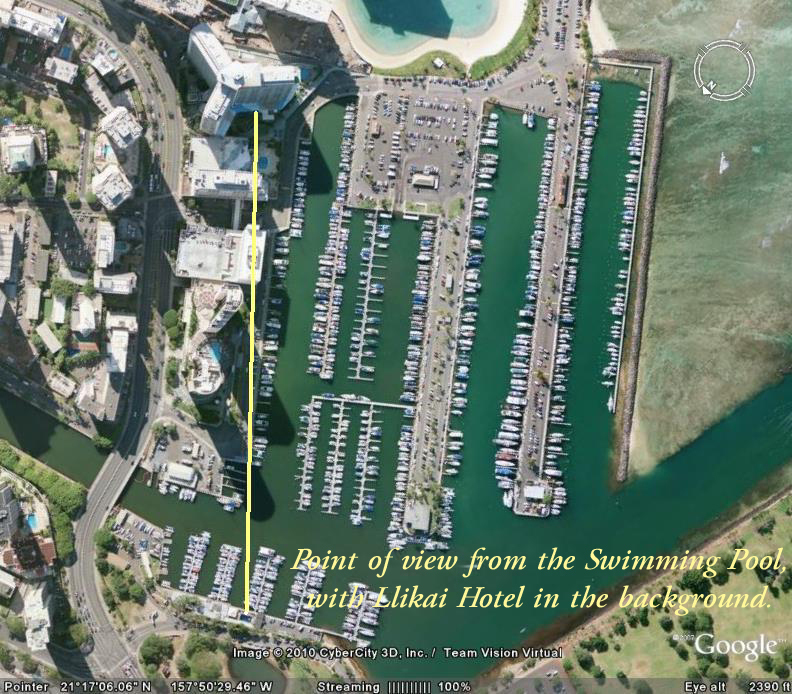 Using Google Earth images of the Ala Wai Yacht Club in Honolulu, as well as screen caps from the show; I now know where the Minnow was docked. To my surprise, I also found the Minnow in the wide harbor shot! Okay, here we go. 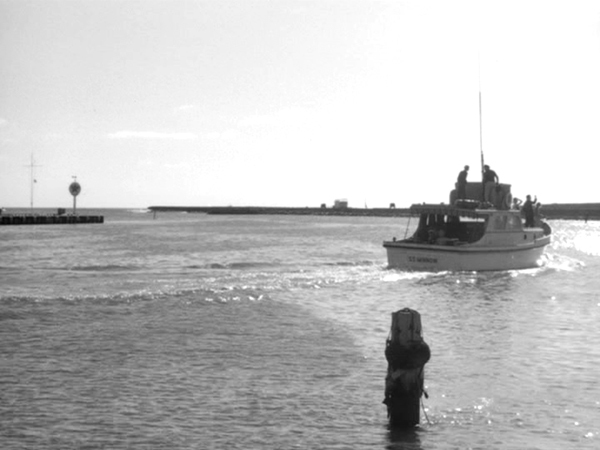 Referring to Photo S1-A, this is the last shot of the harbor in the opening sequence of the first season. The Minnow is visible here. I’ve identified several items in this image that I will refer to later. Note, I’ve hi-lited an area and indicate the Minnow. To the left of the Minnow is a boat that I will call “Alpha”. I’ve also noted the Mast, which is on land. Finally, I’ve noted the Swimming Pool. Now go to Photo S1-B. This scene is only shown in the Pilot. The Hotel in the background is the Llikai Hotel. You can see the Mast, the Swimming pool and the boat I call “Alpha”. The Minnow (not shown) is docked here off to the left. In Photo S1-C, this image is seen in the opening sequence of both the Pilot and Season 1. You can clearly see Boat “Alpha” in the background. 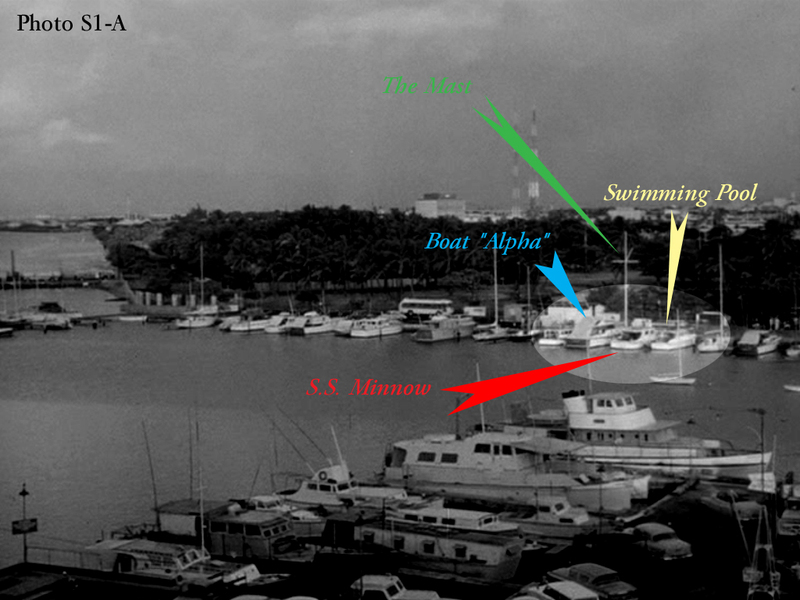 There are two boats docked between “Alpha” and the Minnow. The boat, where the two men are standing, is the same boat on the far left in Photo S1-B. 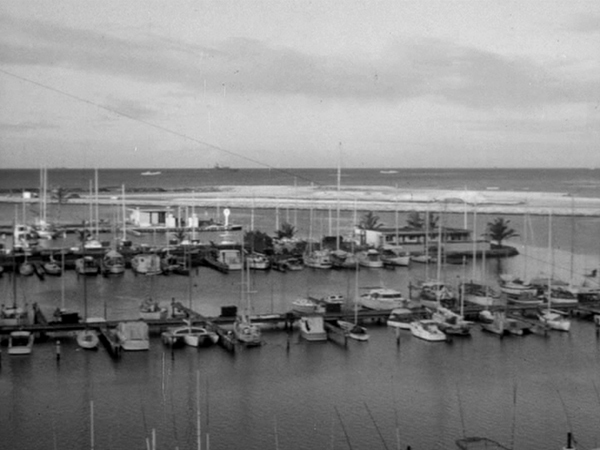 In Photo S1-D, this is a photo of the harbor as it looks today. It is taken from a nearby location as the image of Photo S1-A. In this contemporary photo, you can see the Mast is still there, as well as the Swimming pool. The key difference is that the harbor has been expanded as well as rotated 90 degrees. In S1-A, the boats are docked all in a row, parallel to the land. In Photo S1-E, you can see the Llikai Hotel and the Swimming Pool. I’ve drawn a line between the two. This would be the perspective seen in Photo S1-B. Of note is that in Photo S1-A, “Alpha” and Minnow are docked next to each other, yet in the close-up shots, there are two boats between them. 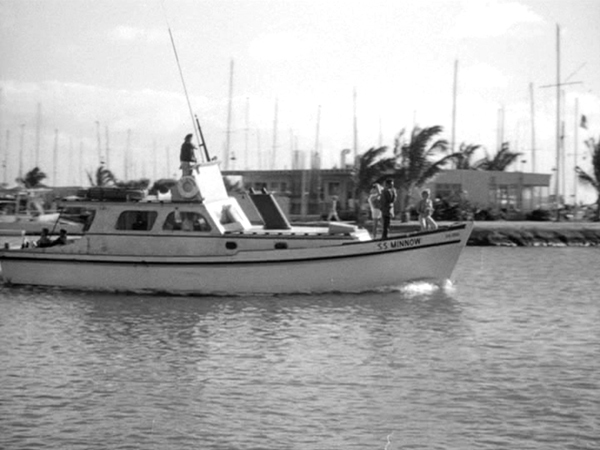 Also, in Photo S1-B, the Howells and Gilligan, by their actions, are approaching the Minnow. There is a similar scene showing the Professor walking the same path. These scenes are only in the Pilot. 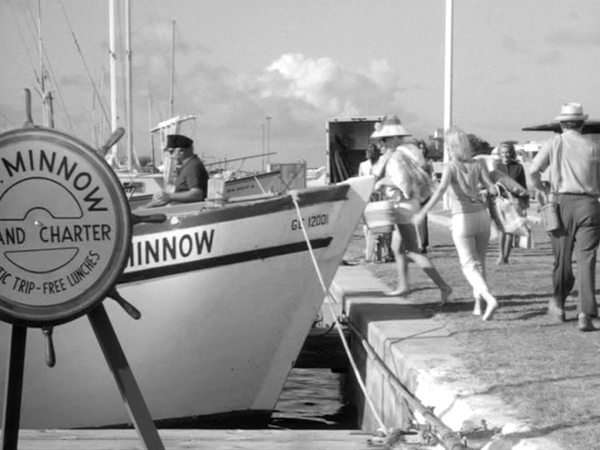 However, as I’ve noted, the Minnow is actually docked to the left of the scene, behind the Howells. This has certainly been a challenging, but fun research.